Asphalt/Composite – This is the most affordable and popular of roofing materials. It may need to be replaced more often than other choices but most warranties average 35 years. This option offers numerous colors and styles. The materials are lightweight, and they are rated for wind speed and impact. Wood – Wood shingles are durable and look fabulous on many different home styles. Of course, fire is a threat and you will need to check for restrictions in your area. Metal – This material is offers longevity. The vintage corrugated roofing you see on old farm houses and sheds is still available and is relatively inexpensive. Consider the new designs in metal roofing as they are attractive and last a long time. Besides being energy efficient and fire resistant, this material comes in a range of styles that mimic other materials. Clay or Concrete tiles – This material is durable but heavy. It can’t be beat for adding to the attractive character of a Sunbelt or Mediterranean-style garage plan. However, broken tiles will have to be replaced by a trained professional, but the upkeep is worth it. Slate – A slate roof will last over a hundred years. It is durable but heavy. Check to make sure your trusses or rafters have the strength to support it. Fort further information, considering contacting the National Roofing Contractors Association. 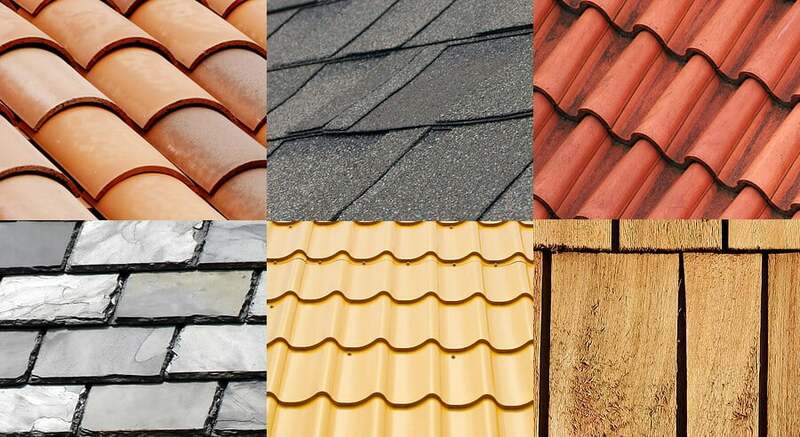 They are a non-profit trade group that represents all aspects of the roofing industry. Do you need extra parking or a sheltered storage space? Are you considering building a detached garage? Below are some of the pros and cons of building a detached garage. · Most stock garage plans are of high quality and provide all the information you’ll need to build the garage with the exception of local requirements due to regional and climactic factors. Some are even available with material lists for an extra charge. · With sturdy doors and quality locks, a garage offers a secure and dry place to park the cars plus store other items in most cases. You can add cabinets and shelves to accommodate tools, outdoor toys, lawn and garden supplies, etc. Some garages even offer an unfinished loft above or another storage space, such as a closet, to handle basement and attic overflow. · Garage floor plans easily offer wall spaces for adding hooks and racks designed to hold everything from the family bikes and leaf rakes to jackets and sporting equipment. · Unlike an open-sided carport, garage plans deliver four walls (if you include the garage door wall) providing complete protection from the sun, hail, wind, snow and rain ensuring your automobiles are safe no matter what weather Mother Nature brings. · With four walls and no opening, garage plans keep small animals and pests away from your car that might otherwise to crawl up inside if the car were parked in a carport or on an open driveway. · Garage floor plans provide an opportunity to convert the unfinished space to usable living space should you have a need to do so in the future. · Building a garage plan can be an expensive project when compared to a carport. 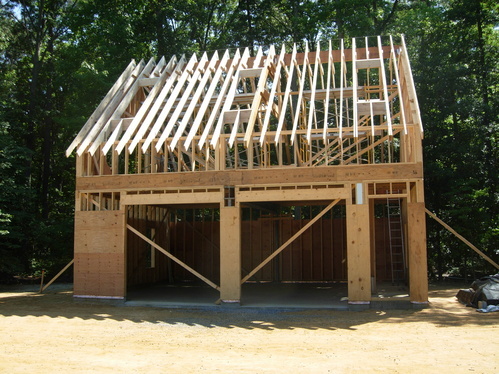 · Garage plans take much longer to build than a simple carport. · In most cases, you’ll have to follow quite a few rules when it comes to building codes and local building regulations. · You may be required to obtain a building permit in order to build a detached garage. You might also have to schedule regular inspections with the building inspector throughout the construction process. Check with your local building department to find out what will be required. If you have the money, space and extra time to build a garage verses a carport, it may be well to your advantage to build a sturdy structure that provides protection on all sides, locked doors, a dry interior and plenty of room for parking and storage. 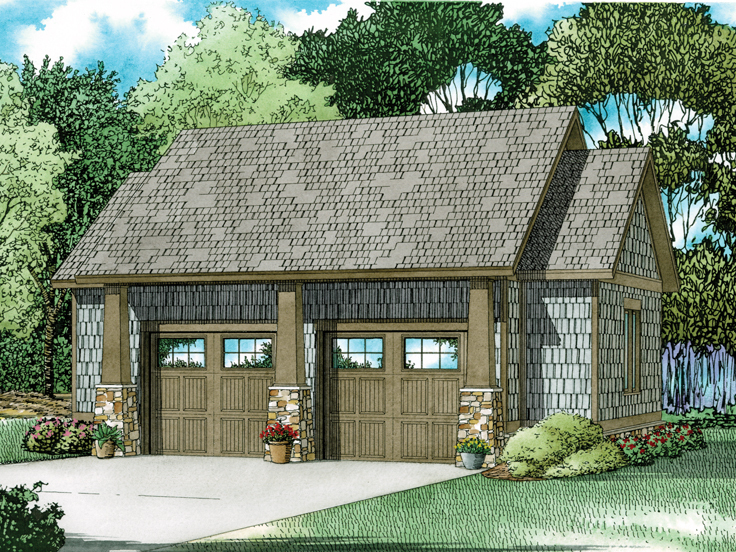 Visit The Garage Plan Shop to find the right detached garage plan for you. 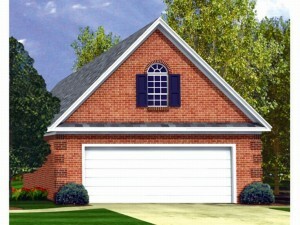 Are you planning on building a detached garage? Great! Detached garages have much to offer in terms of parking, storage, and other uses not to mention they will add value to your home. But before you begin the building process, there are a few things you should consider about the overall structure of your desired garage. The list below will help you with the planning process for your new garage. Consider zoning – Take some time to check with your building department regarding zoning laws in your area. Some cities, counties and communities have size limitations for accessory structures such as a detached garage. Additionally, there may be height restrictions or special requirements for the types of materials that can be used to finish the exterior of your garage (i.e. the exterior finish must match your existing home.) Finally, inquire about the location of the garage. Sometimes there are regulations regarding the placement of the garage in relation to the home and other structures on the property. Size – Consider the overall size of the garage you need. For a 1-car garage, you can estimate approximately 14’x20’. A two-car garage is approximately 20’x20’. These dimensions are just enough room for the cars. It you wish to add a workbench or storage closet or plan to have room for the lawn mower and family bikes too, you’ll need to plan for larger overall dimensions. Finally, you should consider the vehicles you own. If you drive an pickup truck or an oversized SUV, you will probably want a little extra “wiggle room” inside for your larger vehicles. Style – Take some time to consider the style of your home. You’ll want your new garage to blend with your home so choose a garage that features the same architectural styling as your home. Additionally, choose the same or similar exterior materials for your garage that were used to finish your home allowing it to look as if it was originally built with your house. Lot orientation – Think about your lot, the current structures on your property and how your driveway is positioned. Consider the orientation of your new garage on your lot. Will it fit beside or behind your home and still meet zoning requirements? Will you be able to access your garage from your current driveway or will you need to pour more concrete or extend the driveway? With careful consideration of the overall structure of your new garage, it will be easy to choose a garage floor plan that will satisfy your needs, meet local requirements and compliment your home. Whether you’re building your dream garage or just a simple detached, 2-car garage to accommodate the growing family fleet, these garage building tips will prepare you for what is to come while helping to ensure the building experience is exciting and enjoyable. Building a garage is a substantial investment that will add functionality to your lifestyle and enhance the value of your home. Follow our garage building tips to achieve success. Choose a qualified builder. Not everyone who calls themselves a builder is a qualified builder. Take some time to research builders to ensure you’re hiring a qualified and professional builder who can handle the job. Check with family members and friends who have built in the past and ask for recommendations. Interview potential builders and get a feel for their work ethic, construction methods and overall character. After all, you’ll have to work with this person from start to finish, so it is necessary that you hire someone reliable who you can communicate with and trust with your investment. Finally, ask for proof of insurance. Establish a budget and stick to it. Whether you are getting a construction loan from the bank or you’re financing the building project yourself, it is important that you know your budget and stick to it. Plan ahead by pricing out material and labor costs. If you wish to add extra amenities, make a list and arrange them by preference so if you can only afford one or two special “extras” you’ll be spending your money on the ones you really want or need instead of the ones you could have lived without. Also, be careful when it comes to upgrades. Adding too many upgrades will blow your budget quickly. If a particular garage door will satisfy your needs, there is no need to upgrade to the one with all the bells and whistles. Save the extra money you might have spent on the door and put it toward something you really want, such as a half bath or workbench. Establish a timeframe and prepare for delays. Before construction begins, talk with your builder or general contractor to establish a timeframe for construction. A garage is not built in a day and there are a lot of things that need to be coordinated and arranged to keep things running smoothly. Once a timeframe is established, work with your builder and subcontractors to stick to the schedule. Additionally, expect and plan for delays. Delays occur with nearly every construction project. Plan for the possibility of inclement weather, shortage of materials and labor problems. If you plan for them, when one of these situations arises, you won’t be nearly as surprised or frustrated with the delay. Being prepared and flexible will reduce stress at the jobsite. Avoid changes. Once construction begins, avoid making changes. Try to stick to the blueprints and your original construction plan. Changes can be costly and cause delays. Avoiding changes will keep you on schedule and on budget. Monitor progress. Getting involved in the building process is one of the easiest ways to monitor progress. Additionally, active involvement helps prevent construction delays. Once you have established a construction timeline with your contractor, keep a close eye on the work being done and the progress being made. Talk with your builder regularly and ask for updates on progress. Safely walk around the jobsite and observe for yourself what progress is being made. If something doesn’t look or seem right or if something is taking too long, ask your builder about it. It is necessary to work out any glitches are problems as soon as you notice them. The construction process will be more enjoyable and a more exciting experience if you are prepared for what to expect throughout the building process and if you make careful decisions. If you are planning to build a new garage in your backyard or on another piece of property, these helpful tips will help you be ready for what some of the things you’ll encounter in the building process.